Note: This document covers the Puppet Platform repository of open source Puppet 5-compatible software packages. For Puppet 3.8 open source packages, see its repository documentation. For Puppet Enterprise installation tarballs, see its installation documentation. Puppet maintains official Puppet 5 Platform package repositories for several operating systems and distributions. Puppet 5 Platform has all of the software you need to run a functional Puppet deployment, in versions that are known to work well with each other. Puppet publishes updates for operating systems starting from the time a package is first published, to 30 days after the end of the operating system’s vendor-determined lifespan. See The Puppet Enterprise Lifecycle for information about phases of the Puppet Support Lifecycle. If you’re upgrading from a 1.x version of puppet-agent, just update the package_version when you’re ready to upgrade to the 5.x series. The way you access Puppet 5 Platform depends on your operating system, and its distribution, version, and installation methods. If you use a *nix operating system with a package manager, for example, you access a Puppet Platform by adding it as a package repository. 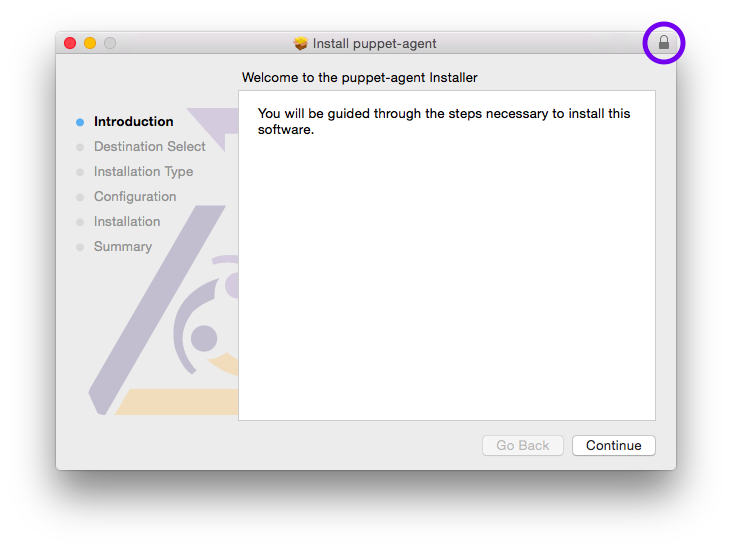 Note: macOS and Windows support the Puppet agent software only, via the puppet-agent package. 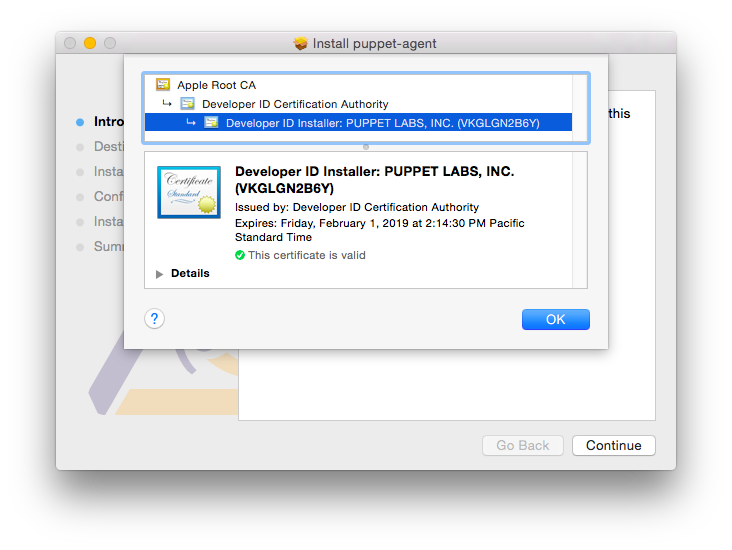 macOS puppet-agent packages are organized by Puppet Platform; for more information, see the macOS installation instructions. For instance, the package for Puppet 5 Platform on Red Hat Enterprise Linux 7 (RHEL 7) is puppet5-release-el-7.noarch.rpm. Note: For recent versions of Puppet, we no longer ship Puppet master components for RHEL 5. However, we continue to ship new versions of the puppet-agent package for RHEL 5 agents. For instance, the release package for Puppet Platform on Debian 7 “Wheezy” is puppet5-release-wheezy.deb. For Ubuntu releases, the code name is the adjective, not the animal. Run apt-get update after installing the release package to update the apt package lists. While the puppet-agent package is the only component of the Puppet Platform available on macOS and Windows, you can still use Puppet Platform to ensure the version of package-agent you install is compatible with the rest of your infrastructure. We sign most of our packages, Ruby gems, and release tarballs with GNU Privacy Guard (GPG). This helps prove that the packages originate from Puppet and have not been compromised. Security-conscious users can use GPG to verify signatures on our packages. Certain operating system and installation methods automatically verify our package signatures. If you install Puppet packages via our Yum and Apt repositories, the Puppet Platform release package that enables the repository also installs our release signing key. The Yum and Apt tools automatically verify the integrity of our packages as you install them. Our Microsoft Installer (MSI) packages for Windows are signed with a different key, and the Windows installer automatically verifies the signature before installing the package. In these cases, you don’t need to do anything to verify the package signature. If you’re using Puppet source tarballs or Ruby gems, or installing RPM packages without Yum, you can manually verify the signatures. Before you can verify signatures, you must import the Puppet public key and verify its fingerprint. This key is certified by several Puppet developers and should be available from the public keyservers. The key is also available via HTTP. Note: If this is your first time running the gpg tool, it might fail to import the key after creating its configuration file and keyring. This is normal, and you can run the command a second time to import the key into your newly created keyring. The fingerprint of the Puppet release signing key is 6F6B 1550 9CF8 E59E 6E46 9F32 7F43 8280 EF8D 349F. To verify a source tarball or Ruby gem, you must download both it and its corresponding .asc file. These files are available from https://downloads.puppetlabs.com/puppet/. gpg: Good signature from "Puppet, Inc. Release Key (Puppet, Inc. Release Key) <[email protected]>"
Could not find a valid trust path to the key. This is normal if you do not have a trust path to the key. If you’ve verified the fingerprint of the key, GPG has verified the archive’s integrity; the warning only means that GPG can’t automatically prove the key’s ownership. Puppet RPM packages include an embedded signature. To verify it, you must import the Puppet public key to rpm, then use rpm to check the signature. Retrieve the Puppet public key and place it in a file on your node. Run sudo rpm --import PUBKEY <PUBLIC KEY FILE> replacing <PUBLIC KEY FILE> with the path to the file containing the Puppet public key. The rpm tool won’t output anything if successful.